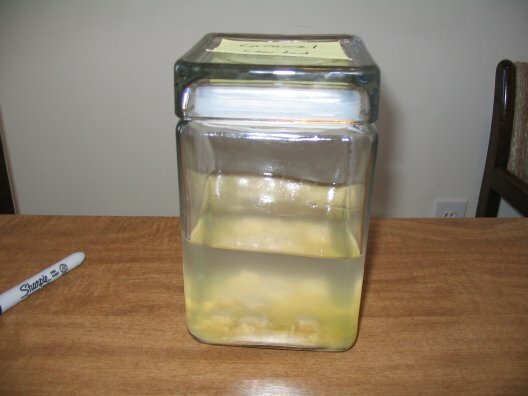 It's time for a game of "Name That Vodka!" All of our ongoing experiments are complete! However, rather than post the results, we've decided to keep our readers in suspense for a while and play a little game. 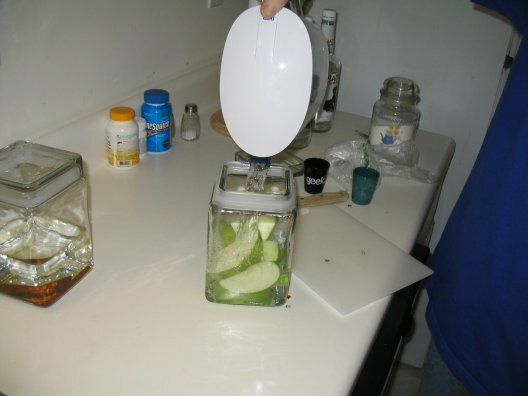 In the following photo, you will see four unlabeled vodka infusions. Your mission, if you choose to accept it, is to identify which is which. One of these is coffee vodka, one is apple, one is caramel, and one is cinnamon. In the comments, tell us which you think is which. One of these is a gimme if you've been paying attention. We will post the results of the experiments soon, along with a few other goodies we've got up our sleeves. Good luck! 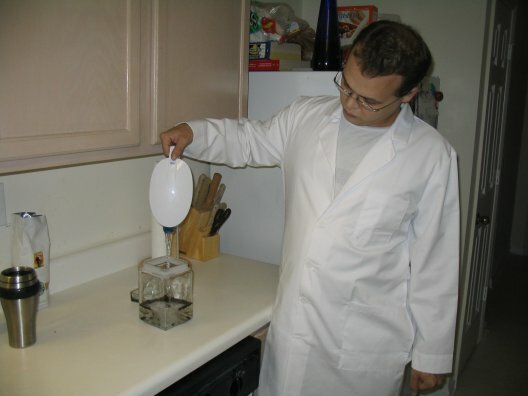 A mad scientician never knows when a beaker will explode or a Tesla coil will overload, so he must always be fully alert. As such, caffeine is a mad scientician's best friend. 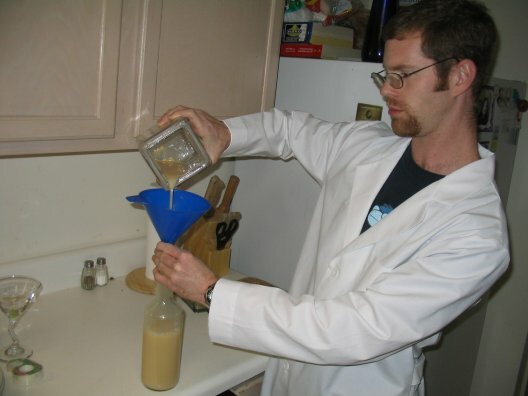 Since we began this undertaking, Wayland and I have wanted to create a coffee-infused vodka, but unlike our previous experiments, our research has failed to find much in the way of guidelines. Therefore, this will be our first off-the-cuff experiment. The only information we could find is that this infusion should happen quickly -- within a day or two. The amount and type of beans, however, we are guessing at. Particularly, we have no idea if this should be done with roasted or unroasted coffee beans. Ultimately, we decided to use roasted beans, since we already have an impressive supply on hand. We buy whole bean coffee from Starbucks, and grind and brew them at home. 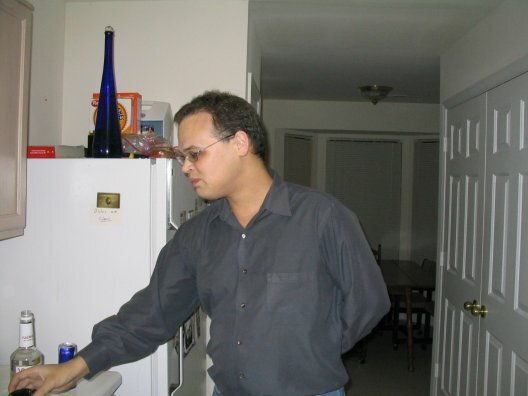 (Despite this, I have never successfully managed to order a coffee at Starbucks; their menu is in some strange foreign language that wasn't taught at Mad Scientician's Academy.) We currently have several varieties available, and decided to perform this experiment using Kenya. Why? Because Kenya's got lions. Believe it! 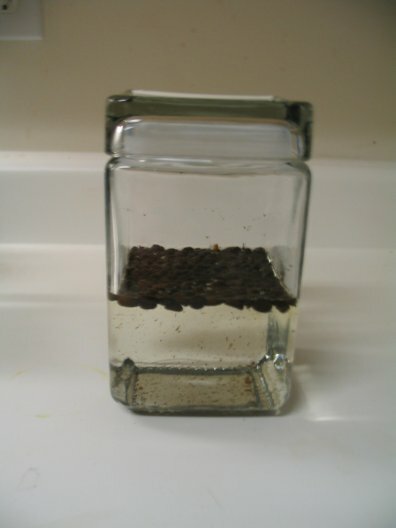 Brendan began the experiment by pouring some coffee beans into the jar. We didn't want to overdo it, since coffee has such a strong flavor, especially a bold coffee like Kenya (medium blends are for wussies). We put in just enough to cover the bottom of the jar. It's possible that even this is too much; we will find out soon enough. 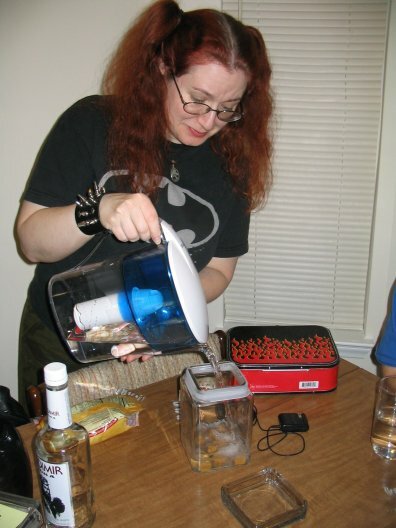 Wayland completes the initial stages by pouring the filtered vodka into the jar. The coffee beans float on the surface of the vodka as they impart their flavor. Several questions remain unanswered. We hope that the experiment will reveal these answers, though we also welcome input from our readers. 1. Will the roasted beans do, or will we have to track down unroasted ones somewhere? 2. Will the beans impart their caffeinated qualities, or merely their flavor? 3. Did we use too many beans? Too few? 4. 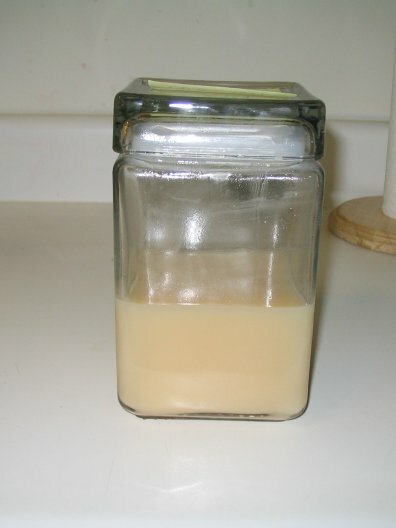 Where the heck do you buy airtight Mason jars anyway? Brendan bottles the creation. 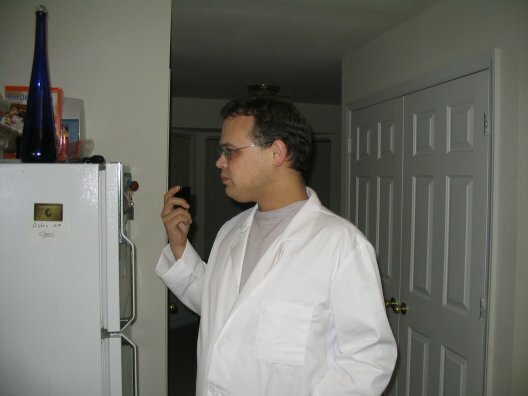 In honor of our first success, we picked up a couple of lab coats today, so we can truly present ourselves as mad scienticians. We noticed a few clumps as it was pouring, so we shook it a little more once it was bottled. We expect some of the caramel to settle, so we may need to shake it each time it's used. It was Wayland's turn to try it first. He enthusiastically praised it as "pretty good." Brendan took the second sample. 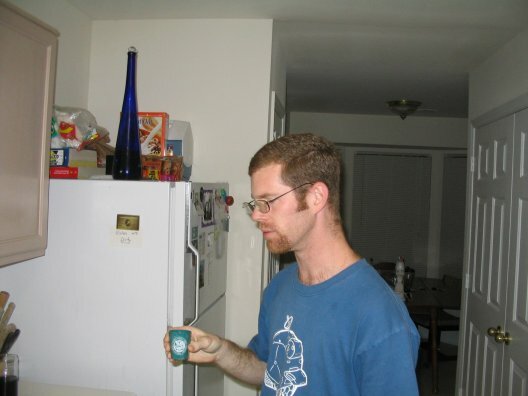 He noted that it was much like drinking a candy bar before the vodka kicked in. All in all, the infusion took on a very noticeable, but not overwhelming caramel taste. We wouldn't recommend shooting this vodka if you don't normally like shooting vodka, but it will be great for cocktails. We are hoping for the same success with the apple vodka; we expect them to go rather well together. We also created a preliminary label design today. Our color printer, however, which has sat untouched for a year, refused to cooperate with us. Once that issue is resolved, we will present our labeled product. Sampling cinnamon; update on apple. We have decided not to restart the apple experiment at this time. One of our kind readers mentioned that the apple infusion, despite not being airtight, should be fine as long as it's covered. We'll run with that advice until this weekend, then strain and bottle it before sampling it. Then, if it turns out to be ruined, we'll start again; otherwise we'll declare success. Brendan lost the coin toss, and was the first guinea pig. 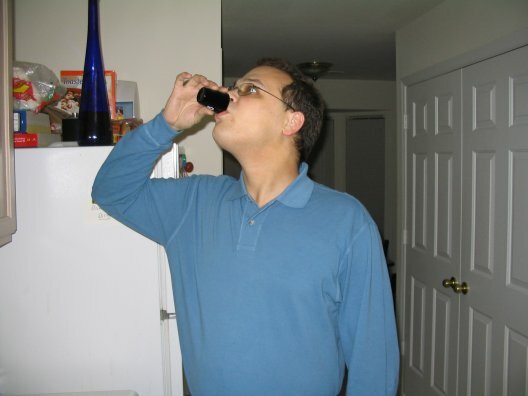 After trying the vodka, though, he called it a win. Wayland took the second shot eagerly. We decided that the vodka is quite distinctively and deliciously flavored, though the flavor is not quite as strong as it looks from the color. We believe it is nearly ready for bottling. We will let the infusion continue until this weekend's New Year's Eve party, and bottle it then. Last night, we discovered a problem that may lead to the failure of at least one of our experiments. 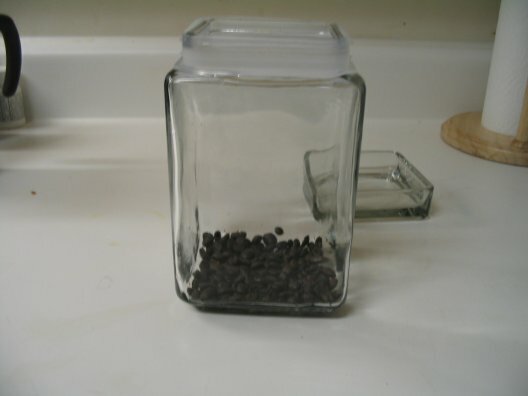 The jars we are using are not as airtight as we originally believed. We found this out when Wayland shook the caramel vodka (most infusions should not be shaken, but we have been told that the caramel dissolves more evenly if it is shaken). 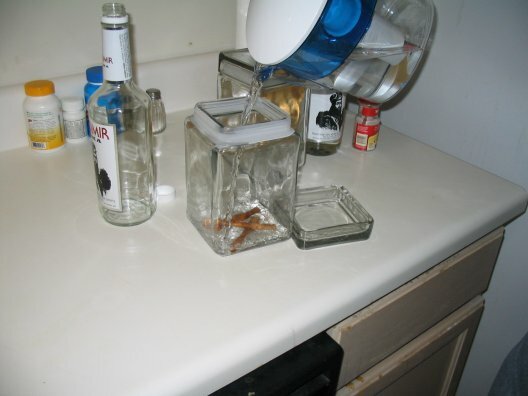 He found that the lid leaked vodka when shaken vigorously. This could explain the smell of the apple infusion. 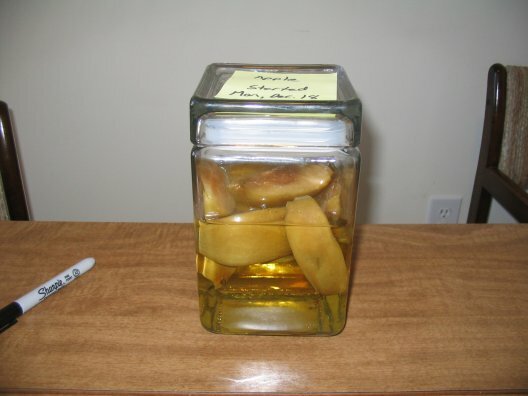 Without a good air seal, the apples may be decomposing. We are hoping that this will not affect our other ongoing experiments; however, the apple infusion may have to be restarted. We will update again when a decision is reached. 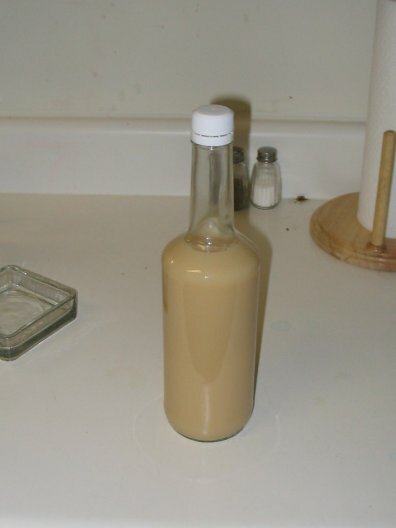 Caramel vodka, and an update on the first two experiments. Last night, Wayland and I hosted a holiday party for our friends, featuring a full Christmas dinner spread including a fried turkey, and of course, drinks. The apple and cinnamon vodkas were not ready, unfortunately; they look good, as you will see below, but we're going to wait until New Year's to start trying to use them. In the meantime, however, we began our next experiment: caramel-infused vodka. 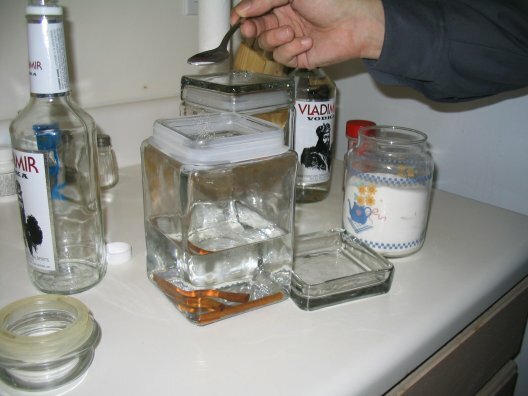 This experiment involved 8 cubes of Kraft caramel, and as usual, a fifth of cheap vodka improved by our quintuple-filtration process. Our special guest star Bevin agreed to assist the Mad Scienticians with this experiment. Bevin and Wayland unwrap caramel cubes into the infusion jar. 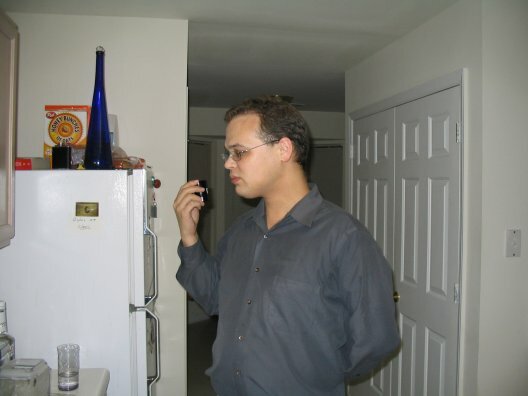 "You want me to try the unfiltered vodka for control purposes? You're freakin' kidding me, right?" The infusion begins. Our friend Amy, whose roomates have created caramel vodka before, says that this infusion only takes four days. It seems that this experiment may be completed even before our initial experiments. The caramel seems to dissolve fairly quickly, as Amy indicated. It's hard to see the cubes in this photo, but they are very pale (the artificial coloration is the first thing to dissolve) and flaky in appearance. The cinnamon vodka looks awesome, much darker than we expected. We were tempted to call it done, but decided to stick with procedure for now. It smells strongly of cinnamon. The apple vodka has attained a green color, but the smell of vodka still overwhelms the apple scent. The apple wedges themselves, predictably, are turning brown, and smell unpleasant. We are trusting the alcohol to kill any organisms that result from apple decomposition. We'll update again in a few days to check on the caramel, and possibly the cinnamon as well. Happy holidays, everyone! Wayland invited his father over to watch the Duke basketball game tonight. I had bought a set of martini glasses this afternoon, which were sitting by the sink to be washed. Wayland says, "We need to hide the martini glasses before my dad comes over!" and sticks them in an unused (and until tonight, unnoticed) cabinet in the lab. One Phillips screwdriver later, Wayland's dad is here, and we're waiting for the game to start. "Dad," Wayland says, "let me show you our latest project." And he pulls up our vodka-infusion blog on the big screen. Brendan reports high levels of confusion. Introducing the Mad Scienticians, and their first experiments. Welcome to the debut entry of "Infusions of Grandeur!" 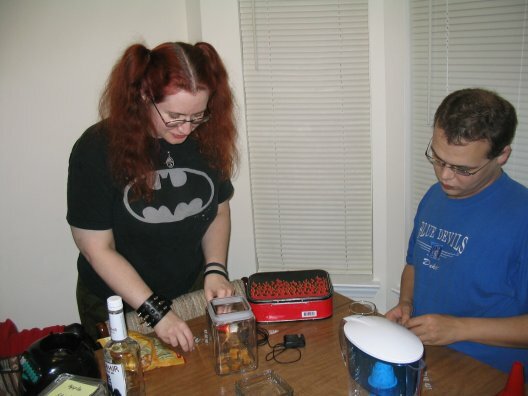 In this blog, your hosts, renowned mad scienticians Brendan and Wayland, will be experimenting with the creation of infused vodkas of all flavors. 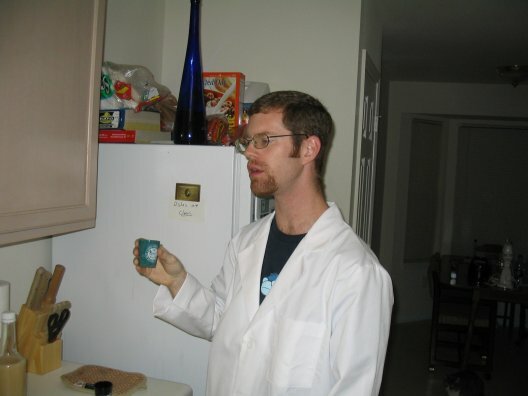 We intend to begin a new experiment on a weekly basis, and update our readers on the creation, testing, and usage of our Mad Scientician™ brand flavored vodkas. 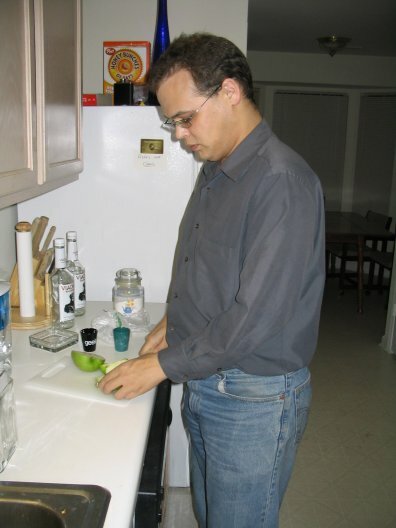 Despite our scientifical backgrounds, however, these vodkas are not professional productions. We have never tried this before, so some of our experiments may very well end in resounding failure. But by the good graces of the scientific method, we will learn and improve, and vicariously, so shall you! Before we move on to our first experiments, a note on methodology. As mad scienticians, as opposed to your garden-variety scientician, we prefer to make our experiments as convoluted as possible, to further our research potential. Furthermore, we have an interest in keeping our costs as low as possible. For these reasons, we have decided to apply the methods developed by Oh My God It Burns!, another band of respected scienticians, in improving the quality of cheap vodka by way of home distillery. 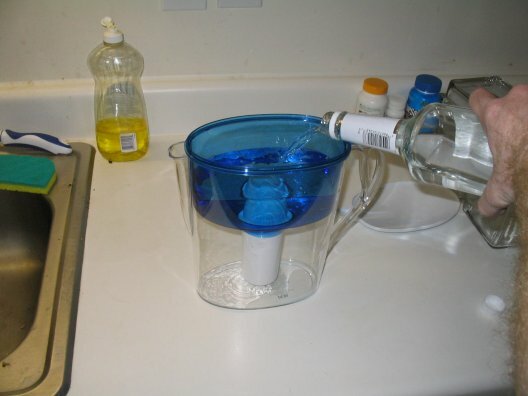 Put simply, the cheapest, vilest, back-of-the-bottom-shelf vodka can be made wondrously crisp and smooth simply by cycling it several times through a Brita or Pur water filter. 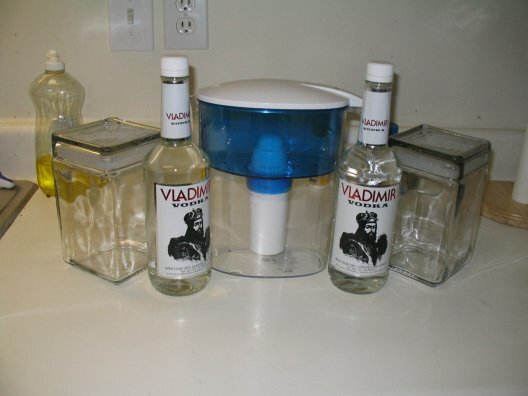 Before beginning the infusion, the vodka had to be filtered into something drinkable. For control purposes, we sampled the vodka in its unaltered form. Brendan volunteered to take the first sample. As you can see, Vladimir (at $5.45 per 750mL) is about as vile as you can get without medical coverage. After seeing Brendan's reaction, Wayland knew this was going to be an unpleasant experience, but he forged ahead anyway in the name of science. 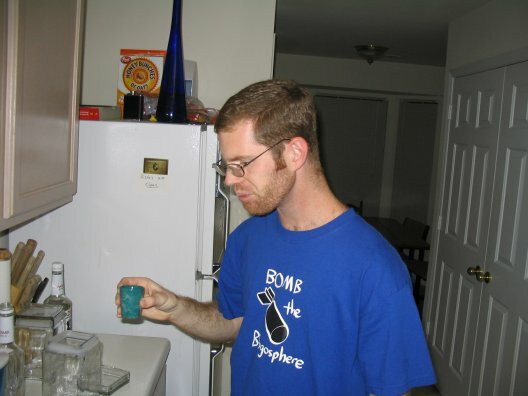 Wayland, having spent part of his college career majoring in drinking Aristocrat, did not react as violently as Brendan, but you can still see the pain he is feeling. Without further ado, the filtration process began. First, we primed the filter with several quarts of water. This clears the filter of any loose bits of carbon. 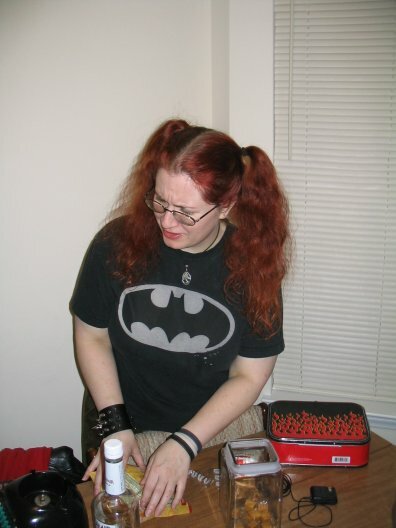 Then we poured in the first bottle of vodka. These filters work by carbon distillation, which is pretty much the same process that vodka manufacturers use. It takes several runs through the filter to fully transform a vodka this bad; we filtered ours five times. Take that, Mr. Triple-Distilled Smirnoff! Wayland appears satisfied. 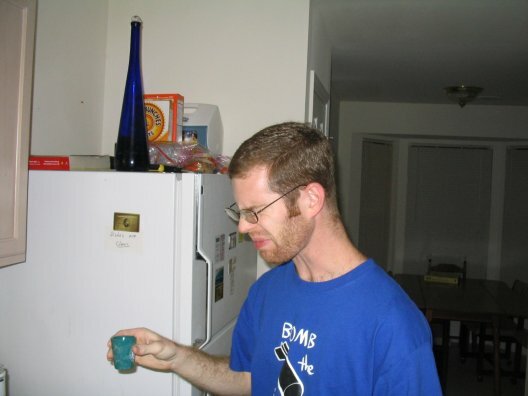 He may not be overjoyed, but hey, this is still straight vodka, people. A slight grimace from Brendan. This is high praise, considering vodka shots normally get at least a reflex head-shake from him. Now that the first transformation is complete and meets with the mad scienticians' approval, we're ready to begin the second. 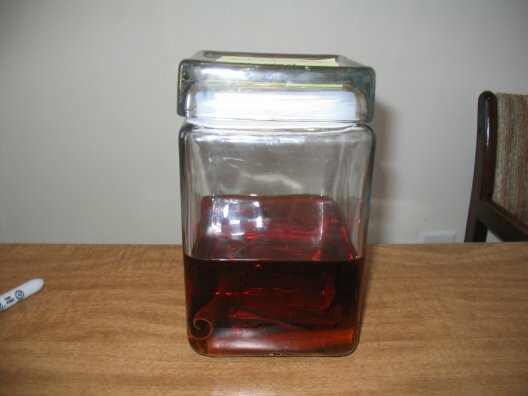 Wayland places three cinnamon sticks in a glass jar and pours the vodka in over it. Our research indicates that a sprinkling of sugar reduces the time for the infusion to set, so Wayland adds half a spoonful. 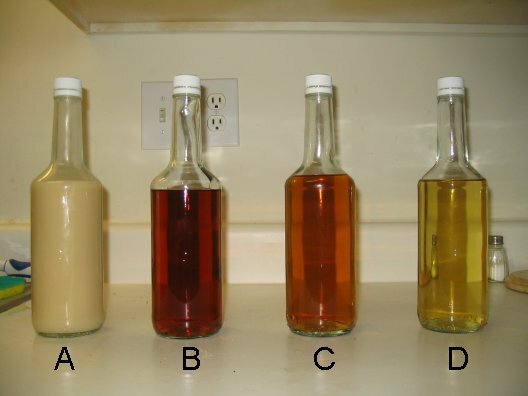 By the time the apple vodka is sealed, you can already see some coloration seeping from the cinnamon to the first batch of vodka. 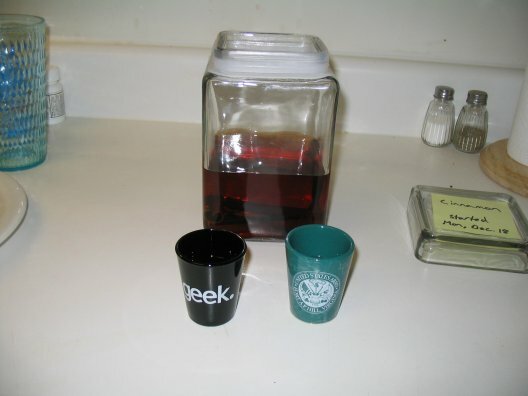 Finally, both jars are placed in a dark cabinet in our lab. 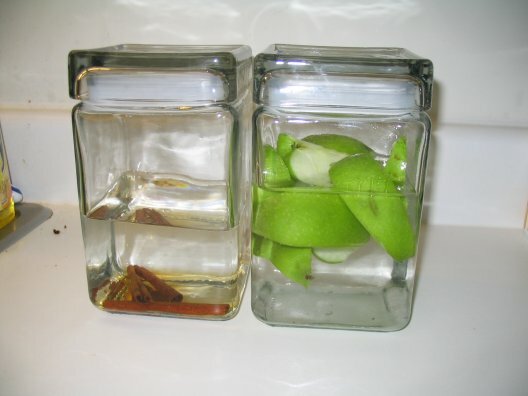 Research indicates that the cinnamon vodka will take two weeks to infuse; the apple vodka will begin to set within a week, but can be left to infuse for up to three weeks, depending on how strong we want the flavor. We'll sample it occasionally along the way and see what we can come up with. We have a party planned for this Saturday, but unfortunately, neither will be ready. The apple vodka may be close; we may try the first sample then. We will also begin our next weekly experiment then. What will be the next featured flavor? We haven't decided yet! Last, but not least, we prepare for the final touch. 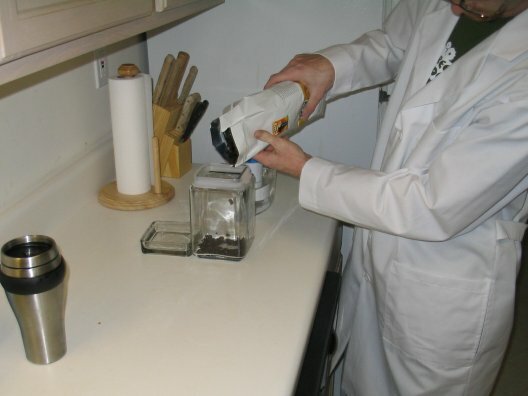 The empty bottles are soaked in warm water to remove the labels. When the vodkas are complete, they will return to the original bottles, free of the bottom-shelf stigma they once endured. In their place, we will be designing our own labels for our creations.